Thomas F. Clucas married Lucy E. Latimer, daughter of John Wilkins Latimer and Martha Jane Espy. Thomas F. Clucas was born circa 1880 at England. Adrian Steven Bowdish was born on 27 February 1878 at Pennsylvania. He married Kate Alverna Latimer, daughter of John Wilkins Latimer and Martha Jane Espy, on 18 April 1903. Adrian Steven Bowdish died on 20 December 1943 at Pennsylvania at age 65. Samuel Irwin Latimer was born on 28 July 1880 at Yankton, South Dakota. He was the son of John Wilkins Latimer and Martha Jane Espy. Samuel Irwin Latimer married Rosalie Elizabeth Baden on 13 September 1904. Samuel Irwin Latimer died on 11 September 1963 at DeSoto, Florida, at age 83. Married Name 13 September 1904 As of 13 September 1904,her married name was Latimer. Rosalie Elizabeth Baden was born on 19 March 1883 at Minnesota. She married Samuel Irwin Latimer, son of John Wilkins Latimer and Martha Jane Espy, on 13 September 1904. Rosalie Elizabeth Baden died on 28 October 1980 at Florida at age 97. Gilbert N. Gibson was born on 31 March 1903. He married Alice Marie Paulson, daughter of Carl Alfred Paulson and Hannah Larsen, on 15 March 1974 at Aurora, South Dakota. Gilbert N. Gibson died on 6 December 1991 at age 88. Married Name circa 1892 As of circa 1892,her married name was Stutts. Annie J. Curry was born in 1860. She married Rufus A. Stutts, son of James Stutts and Ann Ritter Shields, circa 1892. Annie J. Curry died in 1934. Married Name circa 1898 As of circa 1898,her married name was Mercer. Clara M. (?) was born circa 1877 at Pennsylvania. She married Thomas S. Mercer, son of Isaac Morgan Mercer and Sarah Gilliland, circa 1898. Clara M. (?) had 5 with 5 living in 1910 children. Sarah E. Mercer was born circa 1899 at Pennsylvania. She was the daughter of Thomas S. Mercer and Clara M. (?). Morgan T. Mercer was born circa 1901 at Pennsylvania. He was the son of Thomas S. Mercer and Clara M. (?). Rose P. Mercer was born circa 1903 at Pennsylvania. Allen W. Mercer was born circa 1905 at Pennsylvania. Thomas H. Mercer was born circa 1907 at Pennsylvania. (?) Vanore married Myrtle M. Mercer, daughter of William D. Mercer and Ida Jennie Hertz. Name Variation Gustave C. Muchow was also known as Gustav. Gustave C. Muchow was born on 10 June 1858 at Germany. He was the son of Gustave Muchow Sr. and Emilie Lindeman. Gustave C. Muchow married Bertha A. Krueger on 21 April 1879. Gustave C. Muchow died on 27 March 1930 at Sauk, Wisconsin, at age 71. Ship Name: Cimbria. Gustave C. Muchow was naturalized on 6 January 1914 at Circuit Court, Baraboo, Sauk, Wisconsin. [S246] U.S. Federal Census 1880 U.S. Federal Census, by Ancestry.com, Year: 1880; Census Place: Washington, Sauk, Wisconsin; Roll: 1446; Family History Film: 1255446; Page: 264B; Enumeration District: 264; . [S245] U.S. Federal Census 1900 U.S. Federal Census, by Ancestry.com, Year: 1900; Census Place: Washington, Sauk, Wisconsin; Roll: T623_1817; Page: 2B; Enumeration District: 148. [S243] U.S. Federal Census 1920 U.S. Federal Census, by Ancestry.com, Year: 1920;Census Place: Washington, Sauk, Wisconsin; Roll: T625_2015; Page: 6A; Enumeration District: 212; Image: 252. Married Name 21 April 1879 As of 21 April 1879,her married name was Muchow. Bertha A. Krueger was born on 13 December 1859 at Germany. She married Gustave C. Muchow, son of Gustave Muchow Sr. and Emilie Lindeman, on 21 April 1879. Bertha A. Krueger died on 21 March 1926 at age 66. Bertha A. Krueger immigrated in 1861. She had 8 with 7 living in 1900 children. Name Variation Gustav Adolph Muchow was also known as Gustave. Gustav Adolph Muchow was born on 21 February 1882 at Wisconsin also reported as Feb 1879. He was the son of Gustave C. Muchow and Bertha A. Krueger. Gustav Adolph Muchow married Frieda D. Schulenberg before 1915. Gustav Adolph Muchow died on 22 June 1960 at Wisconsin at age 78. On 12 September 1919 at World War I Draft Registration, Sauk, Wisconsin. [S243] U.S. Federal Census 1920 U.S. Federal Census, by Ancestry.com, Year: 1920;Census Place: Ironton, Sauk, Wisconsin; Roll: T625_2015; Page: 1B; Enumeration District: 168; Image: 169. Name Variation Simon H. Muchow was also known as Samuel. Simon H. Muchow was born in February 1888 at Wisconsin. Simon H. Muchow married Lillian H. Schilling circa 1914. Simon H. Muchow died on 17 February 1959 at Wisconsin. [S243] U.S. Federal Census 1920 U.S. Federal Census, by Ancestry.com, Year: 1920;Census Place: Washington, Sauk, Wisconsin; Roll: T625_2015; Page: 7B; Enumeration District: 212; Image: 255. [S250] U.S. Federal Census 1930 U.S. Federal Census, by Ancestry.com, Year: 1930; Census Place: Excelsior, Sauk, Wisconsin; Roll: 2609; Page: 3B; Enumeration District: 11; Image: 88.0. Name Variation Herman Bernard Muchow was also known as Hermann. Herman Bernard Muchow was born on 20 October 1896 at Washington, Sauk, Wisconsin. Herman Bernard Muchow married Adela A. Radatz circa 1919. Herman Bernard Muchow became the godfather at Edna Gertrude Muchow's christening on 28 April 1929 at St John Lutheran Church, Reedsburg, Sauk, Wisconsin. Herman Bernard Muchow died on 25 November 1969 at Madison, Dane, Wisconsin, at age 73. MUCHOW, HERMAN BERNARD, Sandusky, Wis. Inducted Sept. 3, 1918, Sauk Co., Wis; served as private, 161st Dep. Brig; mustered out Dec. 7, 1918. [S250] U.S. Federal Census 1930 U.S. Federal Census, by Ancestry.com, Year: 1930; Census Place: Washington, Sauk, Wisconsin; Roll: 2609; Page: 10A; Enumeration District: 38; Image: 512.0. Walter H. Muchow was born in April 1899 at Wisconsin. Walter H. Muchow married Hattie Bertha Dettman on 26 November 1920 at St John Lutheran Church, Reedsburg, Sauk, Wisconsin. Walter H. Muchow died on 24 July 1979 at Reedsburg, Sauk, Wisconsin, at age 80. Name Variation Lillian H. Schilling was also known as Lily H.
Name Variation Lillian H. Schilling was also known as Lillie H.
Married Name circa 1914 As of circa 1914,her married name was Muchow. Lillian H. Schilling was born circa 1893. She married Simon H. Muchow, son of Gustave C. Muchow and Bertha A. Krueger, circa 1914. Lillian H. Schilling died on 6 March 1985 at Sauk, Wisconsin. Gerhardt G. Muchow married Margaret Weiss. Gerhardt G. Muchow was born in 1915 at Wisconsin. He was the son of Simon H. Muchow and Lillian H. Schilling. Gerhardt G. Muchow died in 1999. Married Name Her married name was Muchow. Margaret Weiss married Gerhardt G. Muchow, son of Simon H. Muchow and Lillian H. Schilling. Margaret Weiss was born in 1919. Michael Joseph Muchow was born on 5 June 1954 at Richland Center, Richland, Wisconsin. He was the son of Gerhardt G. Muchow and Margaret Weiss. Michael Joseph Muchow died on 4 September 2006 at age 52 Michael J. Muchow, age 52, of Reedsburg, died unexpectedly on Monday, Sept. 4, 2006. He was born on June 5, 1954, in Richland Center, the son of Gerhardt and Margaret (Weiss) Muchow. He played football and was in track in high school. Mike worked at the Rock Springs Quarry as plant manager for Martin Marietta Aggregates. He did a lot of butchering and processed sausage, especially metwurst. Mike was a good father and brother and was loved by many. He had many friends, was a man of God, and loved to talk with people. Mike enjoyed golfing, hunting, fishing, bowling, cutting wood and playing cards, especially Sheepshead. He was a Corvette enthusiast. Mike enjoyed Christmas caroling and would occasionally dress up as a bull frog. 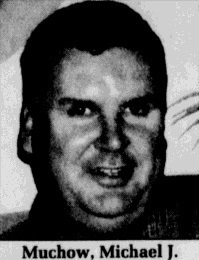 He was preceded in death by his parents; son, Gabriel; brother, Kim Muchow; and friends Vic and Arlene Rindfleisch. He is survived by his daughters, Amberly Mae (friend James Cooper) of Reedsburg, and Tierney Muchow (fiance, Tyler Rego) of Reedsburg; his girlfriend, Rose Schafer of Reedsburg; her daughter, Devin Schafer of Reedsburg; former spouse, Tammy Kaney of Madison; brothers and sisters, Wilma Granberg of Beloit, Lucy Judd of Middleton, Lola (Kenneth) Acherman of Beloit, Anita (Peter) Smith of Lubbock, Texas, Gary (Missy) Muchow of Reedsburg, Leslie (Jacqueline) Muchow of Black Hawk, Linda (Reed) Long of Rockford, Illinois, Kenny (Debbie) Muchow of Reedsburg, Sharon (Bill) Strachan of Clovis, New Mexico, Blanche Fluette of Endeavor, Randy Muchow (Jim Steinhorst) of Reedsburg, Louis Muchow of Reedsburg, Donovan (Mary) Muchow of Prairie du Sac; many nieces, nephews, along with other relatives and friends; and special friends, Bill Rindfleisch and Terry Geyman. Funeral services for Michael J. Muchow will be conducted at 11 a.m. on Friday, Sept. 8, 2006, at WALNUT HILL BIBLE CHURCH in Baraboo with Pastor David Hutchens officiating. Burial will follow in St. John Lutheran Cemetery in Reedsburg. Friends may call on Thursday from 6 p.m. until 9 p.m. at the FARBER FUNERAL HOME in Reedsburg and on Friday from 10 a.m. until the time of the service at the church. The family request memorials of remembrance be made to Walnut Hill Bible Church Men's Ministry in lieu of flowers. The Farber Funeral Home is assisting the family with the arrangements. Gabriel Muchow was born on 24 October 1980 at stillborn. He died on 24 October 1980 Baby Boy Muchow, died Friday, October 24, 1980 at St. Clare's Hospital in Baraboo. He is survived by his parents, Mr. and Mrs. Michael Muchow of Rt. 2, Reedsburg; paternal grandparents, Mr. and Mrs. Gerhardt Muchow of Baraboo; Maternal grandparents, Mrs. Lonna Kaney of Reedsburg and Mr. Vern Kaney, Reedsburg; great-paternal grandmother, Mrs. Lillie Muchow, Reedsburg and a great-maternal grandmother, Mrs. Edward Meyer of North Freedom. Private graveside services were held at 10 a.m. Monday, October 27, 1980, at St. John's Lutheran Cemetary in Reedsburg, with the Reverend James F. Behrens officiating. He was the son of Michael Joseph Muchow. Married Name before 1954 As of before 1954,her married name was Kaney. Lonna Mae Meyer was born on 5 December 1931 at Wisconsin. She was the daughter of Edward Gustav Herman Meyer and Theresa Amanda Repka. Lonna Mae Meyer married LaVern Francis Kaney, son of Albert Charles Kaney and Wenonah Magli Sherwood, before 1954 Lonna Mae Meyer and LaVern Kaney engagement announcement. Lonna Mae Meyer and LaVern Francis Kaney were divorced before December 1976. Lonna Mae Meyer died on 6 November 2012 at Texas at age 80 Lonna Mae (Meyer) Kaney (80) of Reedsburg, passed away Nov. 6, 2012 at her daughter’s home in Austin, Texas. She was under the compassionate care of Hospice Austin, enduring a courageous battle with cancer. 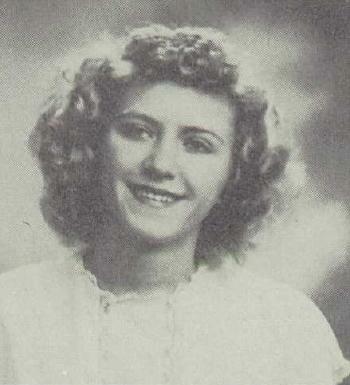 Lonna was born on Dec. 5, 1931 to her parents Edward and Theresa (Repka) Meyer at their home in North Freedom, WI. Lonna most recently worked at Land’s End. Previously she retired from Wisconsin Dairies after 20 yrs. with the company. After retirement she enjoyed staying at her home in Reedsburg and spending time with her many family members and friends in the surrounding area. Lonna liked to escape the Wisconsin winters and enjoyed staying the winter months with her daughter Brenda and family for the last 15 yrs. in Phoenix, AZ and Austin, TX. Lonna was a very loving mother, grandmother, great grandmother, sister, aunt and friend. She was a caring person who made everyone feel special. She was a very hard worker, she always stayed busy with gardening, crafts, cooking and decorating. She had a gentle spirit with animals; she had a pet chicken and pet pig growing up and other beloved pets through the years. She enjoyed dancing as a young girl and all through her life. She had an eye for beauty and could find a piece of wood and transform it into a unique piece of art and craftsmanship. She loved to make people laugh and was a lot of fun. She is predeceased by granddaughter Alesondra Norwalk, sister Gloria (Bud)Ripley, sister Margery Wiggen and brother in law Bob Wiggen, an infant sister, and her parents, Edward and Theresa Meyer. She was a loving mother to and survived by her children: Steve Kaney, Cindy Ali, Tammy Kaney, Brenda Norwalk (Mark); Dear grandmother to grandchildren: Matt Kaney, Tim Kaney(Jen), Amberly Cooper(Jimmy), Tierney Rego(Tyler), and Tesha Norwalk. And great grandmother to: Christian and Josyln Cooper, Dorian Kaney, and Ezra Rego; Siblings: Edward (Gloria)Meyer, Donna (Wilbur)Krayer, and Robert (Beverly)Meyer; many nieces, nephews, friends and neighbors. Lonna Mae Meyer graduated in 1950 at Reedsburg High School, Reedsburg, Sauk, Wisconsin. [S373] U.S. Federal Census 1940 U.S. Federal Census, by Ancestry.com, Year: 1940; Census Place: Freedom, Sauk, Wisconsin; Roll: T627_4523; Page: 3A; Enumeration District: 56-15. Name Variation Edward Gustav Herman Meyer was also known as Ed. Name Variation Edward Gustav Herman Meyer was also known as Edward G. H.
Edward Gustav Herman Meyer was born on 16 October 1894 at Sauk, Wisconsin. He was the son of (?) Meyer and Dora T. (?). Edward Gustav Herman Meyer married Theresa Amanda Repka in 1918. Edward Gustav Herman Meyer died on 25 December 1971 at Wisconsin at age 77 Edward Meyer obituary. [S243] U.S. Federal Census 1920 U.S. Federal Census, by Ancestry.com, Year: 1920; Census Place: Freedom, Sauk, Wisconsin; Roll: T625_2015; Page: 3A; Enumeration District: 211; Image: 118. [S250] U.S. Federal Census 1930 U.S. Federal Census, by Ancestry.com, Year: 1930; Census Place: Freedom, Sauk, Wisconsin; Roll: 2609; Page: 4B; Enumeration District: 14; Image: 138.0; FHL microfilm: 2342343. Married Name 1918 As of 1918,her married name was Meyer. Theresa Amanda Repka was born on 11 July 1896 at Sauk, Wisconsin. She married Edward Gustav Herman Meyer, son of (?) Meyer and Dora T. (? ), in 1918. 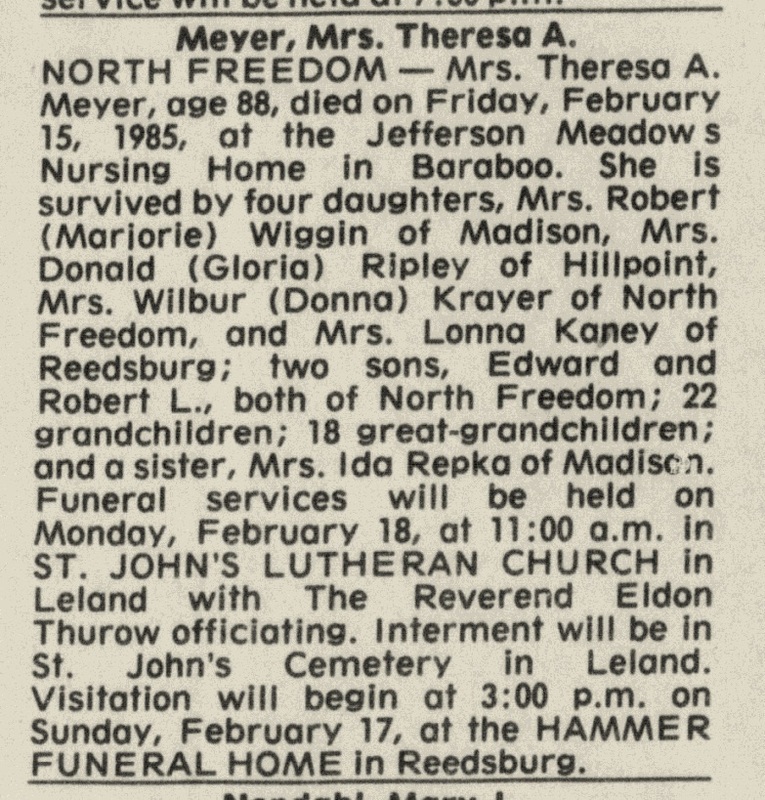 Theresa Amanda Repka died on 15 February 1985 at age 88 Theresa (Repka) Meyer obituary. John Lucas Muchow was born on 6 January 1920 at Sauk, Wisconsin. John Lucas Muchow married Lorraine Evelyn Gall, daughter of William Gall and Lydia Martin, on 10 May 1944. John Lucas Muchow died on 13 November 2002 at age 82 John Lucas Muchow, age 82 of Reedsburg, died Wednesday, November 13, 2002 peacefully at home in Reedsburg. He was born on January 6, 1920 in Hillpoint, Wisconsin to Simon and Lillie (Schilling) Muchow. On May 10, 1944, he united in marriage to Lorraine Gall at St. John's Lutheran Church in Rock Springs, Wisconsin. This marriage was blessed with two sons. John farmed for over 20 years in Ironton Township where he also served as assessor. After moving to Reedsburg, he worked for more than 30 years in carpentry and woodworking. He was a dedicated member of St. Peter's Evangelical Lutheran Church in Reedsburg. John was well known for his butchering and sausage making skills. His joys were his wife, his family, his many friends, his love of baseball and card playing. He is survived by his wife of 58 years, Lorraine; his children, John (Debbie) Muchow of Reedsburg, Wayne (Linda) Muchow of Ashwaubenon; grandchildren, Nathan, Jacob and James Muchow, and Ryan and Marissa Muchow; brother, Harold (Eleanor) Muchow of Cannonsburg, Pennsylvania; sisters, Verna (Gerhardt) Brandt and Arlene (Donald) Westphal of Hillpoint. John is also survived by a large family of nephews, nieces and cousins. He was preceded in death by his parents and brothers, Gerhardt, Hugo, Arnold and Clarence. Funeral services for John Lucas Muchow were conducted at 1:00 p.m., Sunday, November 17, 2002 at St. Peter's Ev. Lutheran Church in Reedsburg with Rev. Kevin Kohnke officiating. Burial followed in St. Peter's Cemetery. Friends called on Saurday from 4:00-8:00 p.m. at the Farber Funeral Home, Reedsburg, and on Sunday from 12 noon until the time of the service at the church. In lieu of flowers, memorials of remembrance may be made to St. Peter's Ev. Lutheran Church. The Farber Funeral Home is assisting the family with the arrangements. Taken from the Reedsburg Independent. Married Name 10 May 1944 As of 10 May 1944,her married name was Muchow. Lorraine Evelyn Gall was born on 28 March 1922 at Wisconsin. She was the daughter of William Gall and Lydia Martin. 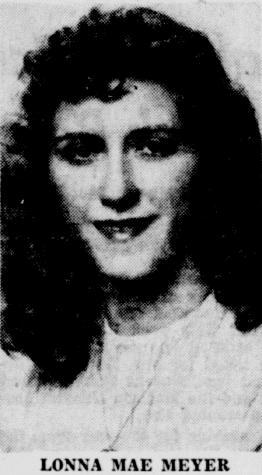 Lorraine Evelyn Gall married John Lucas Muchow, son of Simon H. Muchow and Lillian H. Schilling, on 10 May 1944. Lorraine Evelyn Gall died on 24 November 2006 at age 84 Lorraine Evelyn Muchow, age 84 of Reedsburg died on Friday, November 24, 2006 at the Sauk County Health Care Center. She was born on March 28, 1922 in Rock Springs, Wisconsin the daughter of William and Lydia (Martin) Gall. She was married to John Lucas Muchow on May 10, 1944 at St. John's Evangelical Lutheran Church, Rock Springs. This marriage was blessed with two sons. She farmed with her husband for 20 years in Ironton Township. She was active in the neighborhood homemakers club and the St. Peter's Ladies Aid. After leaving the farm, she was employed by the Reedsburg Cleaners and as a housecleaner. During this time she made many friends through her owrk. Lorraine will be remembered as a friendly, outgoing lady. She was known for her cooking, especially her cheesecake. She made excellent pies and often remarked, she did not know what a pie was until after she married. She was especially proud of the time she spent as a young lady working in Chicago at the Edgewater. She was devoted to her family. Lorraine was especially close to her nieces and nephews and would gladly help them whether it was babysitting, sewing or anything else she could do for them. She is survived by her sons, John (Debbie) Muchow of Reedsburg, Wayne (Linda) Muchow of Ashwaubenon; grandchildren, Nathan, Jacob and James Muchow, Ryan and Marissa Muchow; brother, Harold (Jean) Gall of Lyndon Station; sister, Mary Ann (Paul) Sekaney of Antigo; brothers and sister-in-law, Harold and Eleanor Muchow, Verna and Gerhardt Brandt and Arlene and Donald Westphal; also by a large family of nieces, nephews, cousins and friends and her staff family the the Sauk County Health Care Center whom the family is especially appreciative to for the wonderful and loving care given to her. She was preceded in death by her husband, John on Nov. 13, 2002; her parents and her sister, Gertrude. Funeral services were conducted on Tuesday, November 28, 2006 at 11:00 a.m. in St. Peter's Lutheran Church, Reedsburg with Rev. Paul Crolius officiating. Burial followed in St. Peter's Lutheran Cemetery. Friends called on Monday from 4-8 p.m. at the Farber Funeral Home and again on Tuesday at the church from 10:00 a.m. until the time service at 11:00 a.m. The Farber Funeral Home is assisting the family with the arrangements. Taken from the Reedsburg Independent. John D. Muchow was born on 25 June 1945. He was the son of John Lucas Muchow and Lorraine Evelyn Gall. John D. Muchow died on 16 January 2016 at age 70 John D. Muchow, 70, Reedsburg, died at home January 16, 2016, surrounded by his family after a six-year battle with multiple myeloma. John was born June 25, 1945, the older of two sons of John and Lorraine (nee Gall) Muchow. His formative years were spent on a farm in the town of Ironton. John married the love of his life, Debra J. Schwartz, on March 6, 1976, and they had three sons: Nathan, Jacob and James. 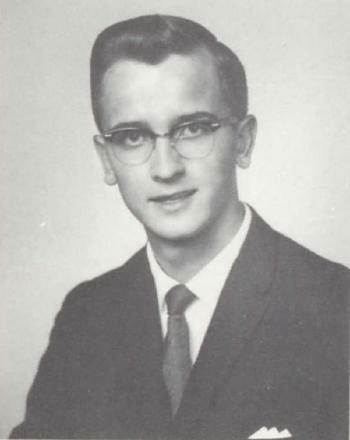 John attended St. Peter’s Lutheran School and Webb High School. He graduated from Stout State University in 1967 with a bachelor’s degree in industrial technology. He later did graduate work in secondary school administration through the University of Southern California. John entered the U.S. Army in July 1967. After initial training, he was posted to the 7th Infantry Division in South Korea during the Pueblo incident. He attended engineer officer candidate school at Fort Belvoir, Virginia, and was commissioned as a second lieutenant before being posted to Fort Huachuca, Arizona, Mohawk School. John completed helicopter flight school in Fort Wolters, Texas, and Hunter Army Airfield in Savannah, Georgia. John spent all of 1970 in Vietnam with the 195th Aviation Company flying insertion and extraction missions. After Vietnam, John was assigned to the Rhineland Falls Engineer District in Europe. He maintained his flight status through the 32nd Army Air Defense Command. John joined the Wisconsin National Guard in 1976 and in the ensuing years served in many leadership and command positions. He completed U.S. Army War College in 1997 and retired at the rank of colonel after 31 years of military service. As owner of Muchow Builders for more than 35 years, John designed, built and remodeled many homes and light commercial properties. His first design-and-build project was Reedsburg Cleaners. Muchow Builders transformed the former Huntley Hotel in Reedsburg into Cornerstone, a residential and retail mixed-use project that helped revive downtown Reedsburg. He also designed and built his family’s home in the Frank Lloyd Wright style. After retirement, John continued to follow his passion for creativity by completing several unique and ambitious woodworking projects despite the challenges of his illness. John was a member of Sacred Heart Catholic Church; the VFW; the U.S. Army War College Foundation and a past member of Reedsburg Jaycees. He served as a board member of the Reedsburg Area Medical Center, Seth Peterson Cottage Foundation, and Reedsburg School Board, serving seven years as board president. John is survived by his wife, Debra Muchow of Reedsburg; sons: Nathan (Kristin Maenner) of Chicago; Jacob and wife Lisa, of Westfield, NJ; James (Molly Gilmore) of Milwaukee; grandchildren Joshua and Sophie; brother, Wayne Muchow (Linda) of Green Bay; brothers- and sisters-in-law Jean Schwartz of Reedsburg, Sue and Craig Schappe of Madison; Sid and Julie Schwartz of Beloit; three nieces and three nephews. He was preceded in death by his parents, mother- and father-in-law Jane and Gordon Schwartz, sister-in-law Virginia (Schwartz) Zinn, and infant grandson, Dylan Muchow. The family thanks Dr. Natalie Callander and the staff at Carbone Cancer Center as well as the staff at the Baraboo Dialysis Clinic for their compassionate care. Funeral services for John D. Muchow will be conducted at 11:30 AM Wednesday, January 20, 2016, at Sacred Heart Catholic Church, Reedsburg with Father David Carrano officiating. Burial with Military Honors will follow in St. Patrick’s Cemetery. Visitation will be held on Tuesday from 4:00 to 7:00 PM at the Farber Funeral Home, Reedsburg, and on Wednesday from 10:30 AM until the time of the service at the church. Memorials may be made to the Carbone Cancer Center or the Reedsburg Educational foundation. John D. Muchow graduated in 1963 at Webb High School, Reedsburg, Sauk, Wisconsin.